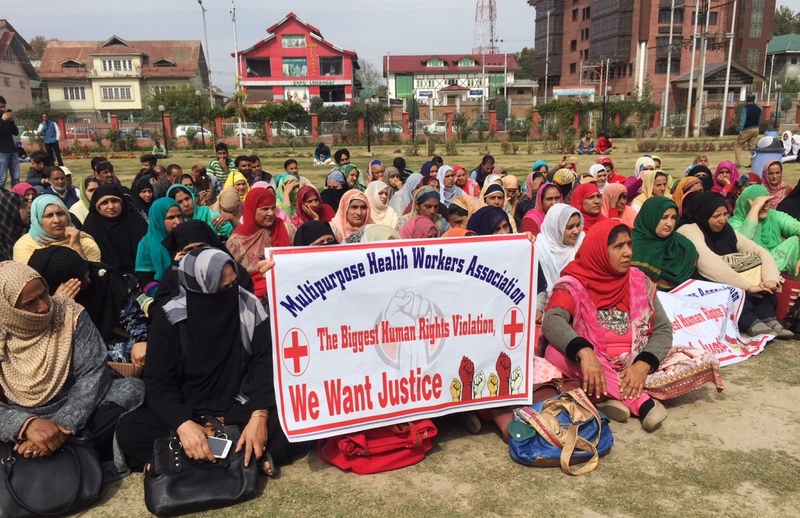 Employees of the Multipurpose Health Workers Association, Jammu and Kashmir on Tuesday held a protest demonstration at Partap Park in Srinagar and sought the regularisation and promotions in the department. Employees of Multipurpose Health Workers protest in Srinagar, KL image. Scores of the employees from various districts of the valley shouting slogans assembled at Partap Park and registered their protest against the delay in promotions. The protesting employees’ said that they are serving the department for 25 years but nobody from the category has gained any promotion till now. “We all are seeking the promotions the way every employee in the health department gets,” one of the protesting employees Manzoor Ahmed, Block president Qazigund said. “We all are technical hand but nobody among us is falling in the category of technical employees in the department,” Manzoor added. They said they have been listening from years that the file is under process but acccordi9ng to them there is no initiative taken by the government to promote them till now. The employees said they were selected under the SSRB grade, “even after passing one of the tough phases to get into the department, we all are in the same place even after serving twenty-five years.